Homura Shooter for Android phones! 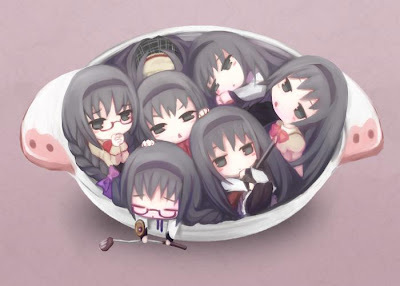 So I found this shooter for Android phones to have more Homura of Madoka Magica on my phone. Basically, you play as Homura and go through and kill ever witch you meet in the show. Their is a few different weapons, shotgun, bazooka, machine gun, bombs and the basic handgun. You can also use the time stop ability but it doesn't seem that useful atm. I have beat a few of the bosses so far, but I only started today. It is pretty fun, luckily they have a bit of auto aim for the crappy aim my thumbs have. Definitely a fun game, though it feels pretty simple at this point. I'll play more as on my train rides to and from work to see if it gets harder. If you wanna be a bit more legit just follow link in the video to buy it.